JGI Genome Portal Help: Portals for Genome "Groups"
Community Science Program JGI Proposals, that include multiple genomes, transcriptomes, or other data sets, now have "group" portals aggregating individual portals within the proposal and providing a single access point for download of all data related to the proposal. 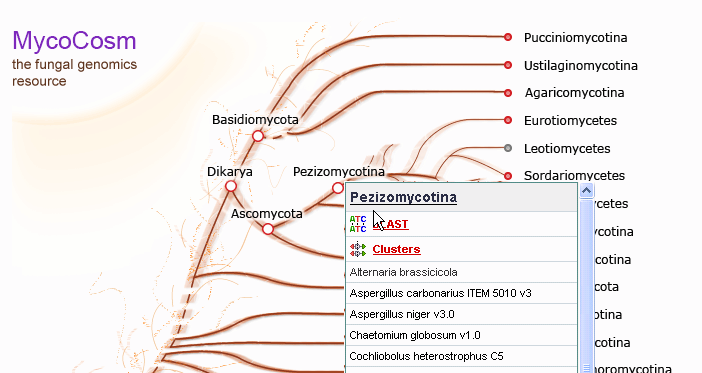 The JGI has created groups for all fungal taxa, which can be accessed through Mycocosm, The JGI Fungal Genomics program site. Click on any node in the mycocosm tree. The first link you see in the reslting menu is a link to the the corresponding Group Portal site for that taxon.